Organic Deodorant is a “beauty and personal care” product that nearly every adult invests in, as many people consider it a necessity. In efforts to stay more natural many people like the idea of an organic deodorant but have trouble finding one that works. Check out some organic deodorants that actually work. What Is An Organic Deodorant? These days it seems as though many adults are trying to make their lives more “green” by investing in and using organic and natural products. 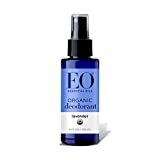 As you transition into a healthier and sustainable way of life, you may be having a difficult time finding a good organic deodorant that keeps sweat and odors at bay. While many people are happy to go au naturel (without) when it comes to deodorant, there are plenty organic deodorant brands that are natural and effective. Having a hard time finding an organic deodorant that keeps you feeling confidently odor-free all day long? Check out five of our favorite picks that actually work. It’s a good idea to discuss some of the main differences between organic deodorant and other deodorants on the market. Non-organic deodorants contain aluminum (which makes it an antiperspirant) and other chemicals. Many people avoid aluminum in fear of increasing the risk of cancers or Alzheimer’s disease. If you’ve shopped around for organic deodorants, and tested a few out, you may feel a little underwhelmed by your results. While there are organic deodorants that do work (and we’ll give some of the best), organic and natural deodorants have a reputation for leaving its wearers less than dry or odor-free. Indeed, trying to find a deodorant that has everything you need (from a pleasant fragrance to being within your budget) can take more time and energy than anyone wants to spend on deodorant; that’s why we did the work for you. How did we determine the best organic deodorants on the market among the dozens of others that line the shelves? We spend time doing research, so you don’t have to, and we’ll even test out the products if we don’t find enough reliable information on a product. We read labels, reviews, and scour the Internet to see what everyone else has to say about a specific organic deodorant. While we only recommend the deodorants that get the best ratings, we take all comments (including the negative) into account when compiling our list. We use a five-star rating system to rate a product. Five stars mean that a product exceeds our expectations and has overwhelming praise from other reviewers and users. Even if some of the deodorants on our list don’t have a full five-star rating, it doesn’t mean it’s not a good product. While we love to review and suggest a product with five-stars, we never give a product top-rating without doing adequate and thorough research first. Deodorant purchases can be frustrating, especially if you don’t know if you’ll like the way it smells or how it feels throughout the day. The only way to really know how it will work for you is to try it out. Even though we do our best to give you thorough reviews, we can’t speak for your personal preferences, how your body’s chemical makeup reacts with certain scents, or even how much you sweat. See an organic deodorant you like (or think you want to try)? Your best bet is to buy it and give it a try. While many organic deodorants seem to be more “unisex” than the non-organic deodorants that we see lined up on the shelves at our stores, you might be wondering if there’s a difference between men and women’s deodorant. The quick answer is “no.” The formula isn’t different, but the scent is; one may be more “masculine” than another. Since deodorant comes down to scent for a lot of people, you can wear whatever you want. While organic deodorants have a lot of similar ingredients (which are natural and “safer”), you still need to pay attention to the ingredients if you have sensitive skin or allergies to specific herbs. As with all deodorants, and other beauty products, it’s always wise to follow the manufacturer’s directions. If the recommended “dose” is a thin layer once a day, don’t slather on the deodorant multiple times a day. Some reviewers complained of skin irritation with various organic deodorants, while it’s unknown why the irritation occured, it could be related to over applying the deodorant. Organic deodorant is a healthier and natural product, but reading the label can help you determine if you’ll like it or not. Let’s take a look at our list of the best organic deodorants. We always start off our list with our top pick, with the highest rating, and then we share some other products that you might want to try as well. Remember, even though some of our deodorant choices don’t have a five-star rating, it doesn’t mean it’s not a great product. Thus we only recommend products that we are confident about; a four-star rating is great, just not the best (in our opinion and after research). Here are some of the best organic deodorants that you should try. Underarmed For Men and Women has a no-nonsense label and if you were to see it on the shelves of a store, you might not even notice it among the brightly colored labels and graphics on other deodorants. This deodorant is free of aluminum, parabens, triclosan, phthalates, and other harmful chemicals. According to the company, Underarmed is suitable for everyone from kids to adults and provides all-day protection. The deodorant is never tested on animals and is packaged with recyclable materials. The 2.6-ounce deodorant goes on clear and doesn’t leave a residue on clothing. Organic ingredients include coconut oil, cruelty-free beeswax, baking soda, avocado butter, sunflower oil, castor bean oil, raw honey, essential oils, and Vitamin E. Super Natural Goods recommends applying a thin layer to the underarms and never on broken skin. The company also offers a full refund after 30 days if it’s not the “best” organic deodorant you’ve ever used. Stroll through the aisles of your grocery store and chances are you’d recognize the Arm & Hammer logo in a heartbeat. You may even have their cleaning products under your sink or a box of baking soda in your cabinet. ARM & HAMMER Essentials Natural Deodorant may seem like an unusual type of organic deodorant, but it contains no aluminum, parabens, or colorants. The deodorant is available as Fresh or unscented and is a suitable vegan-friendly option for both men and women. The clear 2.5-ounce deodorant looks similar to other clear sticks and doesn’t leave behind any residue. The ingredients include baking soda, coriander fruit oil, rosemary leaf oil, and lavandin oil. Some of the benefits of the ARM & HAMMER deodorant is that it is available in most brick and mortar stores and it’s a little more budget-friendly than comparable deodorants. EO is a company that has worked hard for over two decades to create and distribute beautifully-smelling and organic health and beauty products. Their motto is “Love Life, Live Clean,” and their extensive line is reflective of their passion for organic products. The spray is packaged in a 4-ounce recycled blue bottle and contains no aluminum, propylene glycol or zinc salts. 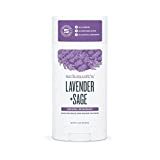 Ingredients include certified organic ethanol and an essential oil blend of lavender and Lavandula hybrida. EO recommends “refreshing” your underarms as needed throughout the day. If you’ve purchased other natural and organic health and beauty products throughout your lifetime, you may be familiar with Tom’s of Maine. They’ve been in the natural health and beauty business for over four decades. Tom's of Maine Natural Long Lasting Deodorant, much like the ARM & HAMMER deodorant, is readily available at most stores and is a budget-friendly option. With a variety of scents to choose from, the Tom’s of Maine deodorant is suitable for both men and women. Ingredients in the clear stick include aloe leaf juice, sunflower oil, hops extract, and various essentials oils (depending on the scent you choose). Schmidt’s deodorant was first created in a Portland, Oregon kitchen by a woman (the founder of the company) who wanted natural products for her family and friends. While the success of the deodorant was slow to get momentum, it has become increasingly popular since 2010. Schmidt's Deodorant Stick is available in a variety of scents, which makes it a versatile deodorant for both men and women. The 3.25-ounce deodorant has a similar feel to non-organic deodorant sticks and is free from aluminum, parabens, phthalates, parabens, and propylene-glycol. Schmidt’s is vegan-friendly and never tested on animals. Ingredients include arrowroot powder, coconut oil, shea butter, baking soda, jojoba oil, essential oils, and Vitamin E.